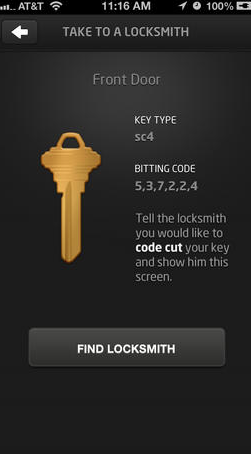 A new app, KeyMe, has been released for iOS. The idea is that you take a picture of your keys and then, if you lose one, you can show the picture to a locksmith and get a new key. I tried it out and it is very straightforward to use. One can imagine that if there are 3D printers around you won’t even need a locksmith in the future to get a new key. What was interesting was the pricing scheme. The app is free. That is, you can download it, sign up, scan keys and have them analysed for free. However, and here is, I guess, ‘the catch’: if you need to get the scan so you can get a new key, then you have to pay $10 which you can do as an in-app purchase. This is a very clever pricing scheme. Basically, the app is only useful if you need it. Moreover, when you need it, you really need it. So rather than charging everyone $1 to obtain the app and control the data, they charge you only in the event the app is really useful. And the $10 price isn’t gouging. Unless you assess your probability of losing a key at more than 10%, you are better off with the ‘pay later’ pricing scheme. In other words, the app automatically charges more to those prone to lose keys. To be sure, that means there is no social insurance in key loss but then again, one suspects that would be a bad idea as those who know they are prone to lose keys know that. Of course, those people may also be prone to lose phones but at least in the event you lose both you haven’t been charged for an app that is, at that point, useless. This is going right to the top of my list to teach students about innovative pricing. I have always wondered why phone recovery apps (like lookout) didn’t use this pricing scheme by default. They always instead wanted me to buy the premium service before I lost my phone. And you give the NSA the keys to your house? Previous PostPrevious Should Apple be forced to host rival book retailers for free?